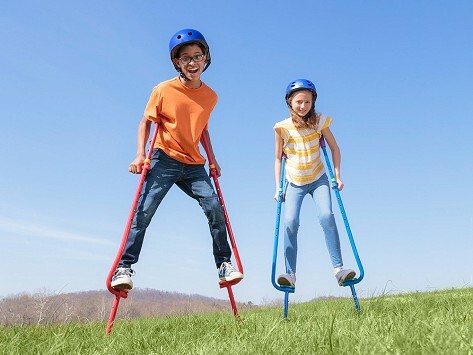 These stilts for kids balance ease of use and fun—a win-win in our fun-for-kids book. The stilts are adjustable to keep up with growth spurts or to give each kid a perfect fit. Arched feet make for better balance and smoother movement. Thoughtful features like foam-covered handles, armrests, and extra traction on the foot pads make the stilts super kid-friendly and they are sturdy enough to let adults give them a try, too. Stilt height adjusts from 51" to 79"
Dimensions: 51.97" x 7.87" x 19.69"
The stilts for kids from Amazing Featz are a redesign of the classic that feels and moves better. They work the same way—kids cruise around feet above the ground—but this pair was made to be easier to use. The stilts are designed to give kids a more comfortable fit and walking experience, with features like foam-covered handles, ergonomic armrests, and roomy, threaded foot pads that lend extra traction. Arched feet at the bottom of these stilts might make you look twice, but the unique shape gives kids more stability and makes for smoother movement. Unlike the old-school stilts you may have tried, Amazing Featz stilts are adjustable so a pair can grow along with your child. And they are sturdy enough to handle grown-ups who can’t resist giving them a try.